Machinists Union members are playing a critical role in battling the wildfires in California—even as they deal with the destruction of their own property. 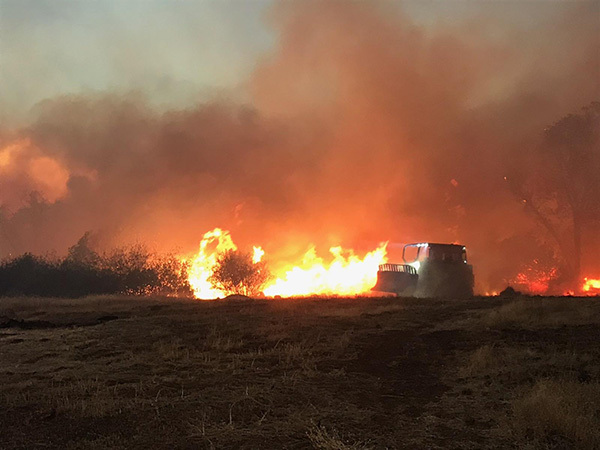 Members from NFFE-IAM Local 1995, which include forest fire engine crew members, hand “hotshot” crews, and heavy equipment operators known as dozers, are working on the frontlines to contain the catastrophic wildfire. Members are utilizing their certified expertise, gained from thousands of hours of training, to fight these type of forest wildfires. The California Camp Fire has already killed 79 people, with hundreds more reported missing, and destroyed more than 10,500 homes. More loss of life and property are expected once crews are able to fully access the affected areas. Experts estimate that damage from the fire will exceed $19 billion. As our members perform their heroic service, their families are being displaced and the raging wildfire is destroying their property. NFFE-IAM Local members will soon face the agonizing task of rebuilding after this natural disaster comes to an end. Other IAM members across the state of California face similar situations caused by the numerous fires that are wreaking destruction and death across the state. WATCH: International President Martinez honors the California fire victims. We are calling on the generosity of the IAM family—one of our enduring values—to help our Sisters and Brothers in California as they start on the long process of rebuilding their lives. If you can, please help Machinists Union members devastated by the Camp, Woolsey, Hill and the more than a dozen other wildfires raging across the entire state of California.